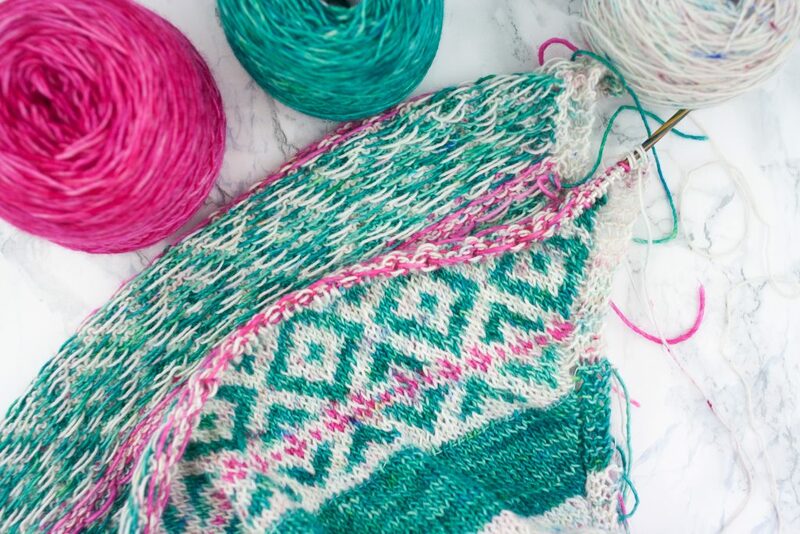 New skills are always a challenge – A fair-isle shawl story. One of the thing I love in knitting is learning new skills. There’s always something new to learn or to try. Fair-isle was quite a journey for me and I can say for sure I enjoyed every step it took. I’m a French knitter, which translate in the knitting world by I knit with yarn in my right hand (English knitting style). I was thought to knit colourwork in the least efficient way possible: dropping the yarn at each color change and weaving every color change. SOOOO slow and boring! 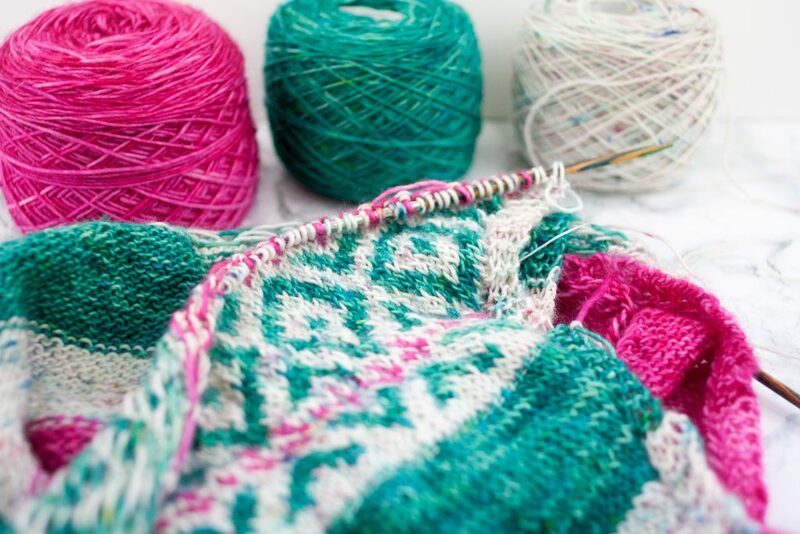 I dug the Internet in search of better (= faster) ways to knit colourwork and discovered a whole new knitting world : some knitters knit with yarn in their left hand (continental knitting style) and colourwork can be knitted with stranded floats AND with yarns held in both hands ! My quest of the perfect tension then began. It took me a while to master a way to wrap and hold the yarn in my left hand but I can surely say that knitting Fair-Isle on the right side of a piece (or in-the-round) is no longer a challenge. Stranded floats requires a bit of practice too but it worth it! Extra warmth (because it creates two layers of wool with air between them, hence a better isolation), gorgeous wrong sides, and steeks, here I come! This shawl is my first try at stranded colourwork on the wrong side. 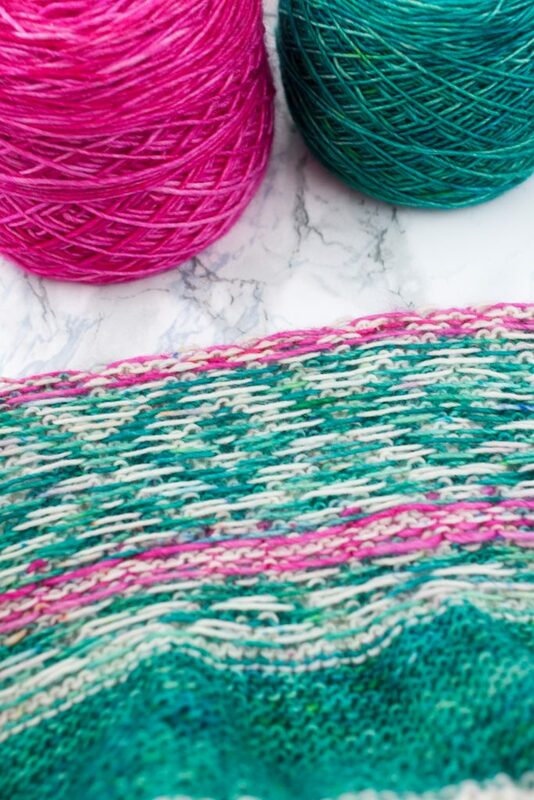 One of my goals here (besides knitting a gorgeous shawl ) was to learn to knit stranded knitting on the wrong side while holding yarns in both hands. Well, I think I mastered it! As always, the key thing to remember is “Lower path = more yarn ; More yarn = bigger stitch”, hence dominant colour. While knitting the right side, this translate in holding the dominant colour in the left hand. It took me ages to realize it but, for once, the rule is the same for both the right and the wrong side: always hold the dominant colour in the left hand and the background colour in the right hand. No fuss, no muss! You can clearly see were the light bulb went on in my head when looking at the background of the shawl.  The knitted fabric is more relaxed, doesn’t wiggle anymore and the colourwork pattern is even more prominent. Epic win!